Second time's a charm. Or something. More stuff with popsicle sticks. As if you need more ideas. 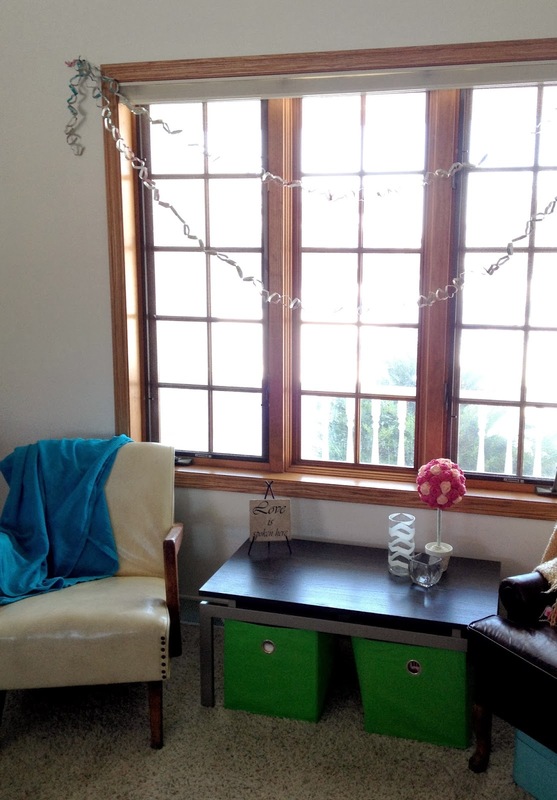 A new take on an upcycled oldie. Is it PEE-can or peh-CAHN? 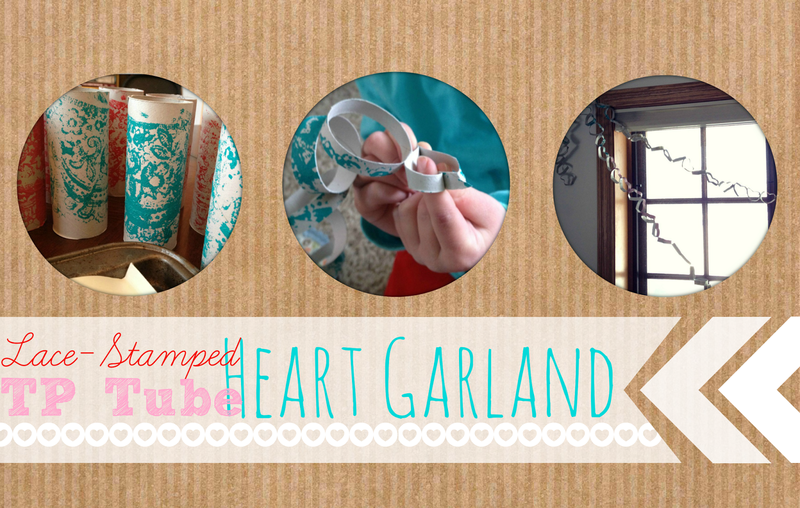 A while ago I realized we needed a new Valentine garland, because quite frankly I have no idea where our handy heart garland went. I mulled it over for a bit, since there were some important criteria for said garland - a. it had to use readily available materials and 2. it had to be easy - and decided to do a new take on our pumpkin garland of many, many moons ago. I like this new take even better than the first one. In our new version, I wanted to add interest to the tubes without simply spraying them or painting the whole thing. In my mind, lace is always associated with romance and therefore Valentines - so that's the direction I went. TP tubes. Several - the exact number depends on how long you want it. 1. Lay several layers of paper in a baking sheet. Preferably a baking sheet you don't actually use for baking anymore. 2. 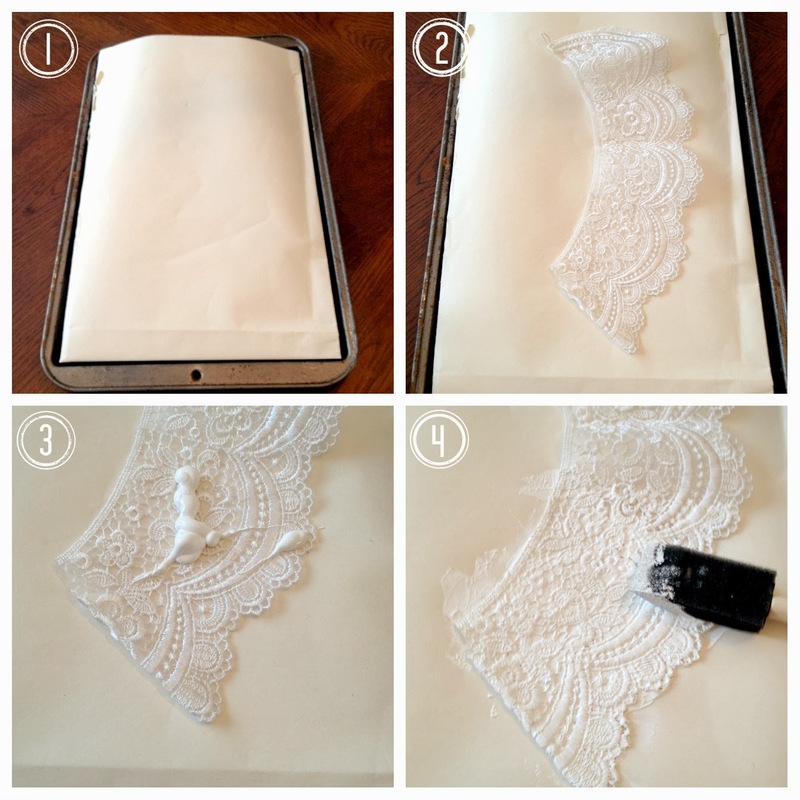 Cut a piece of lace to fit easily on the sheet. Note: the ideal lace will be about as wide as the tube is long, have an interesting design without being too fine or delicately detailed and NOT be curved - like mine is. Ces la vie, right? 3. Pour some normal craft paint in your choice of color right over the lace. 4. 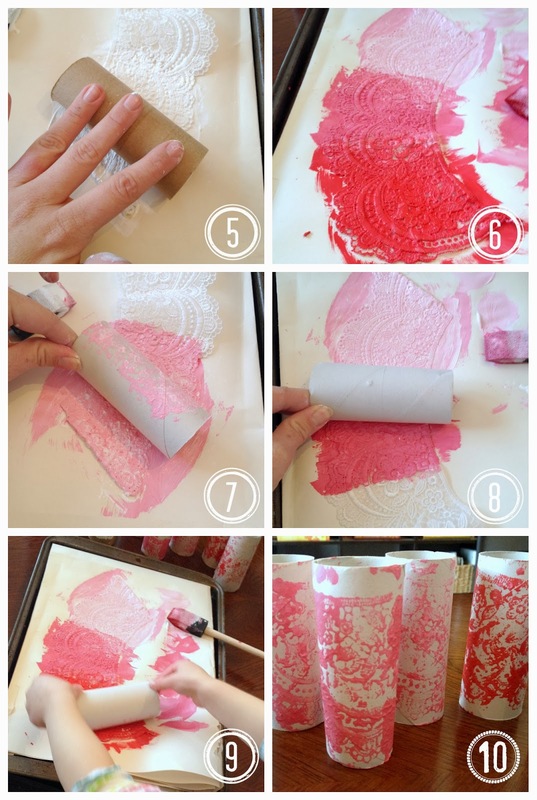 Spread the paint out over the lace with a foam brush. Really get into those details. 5. 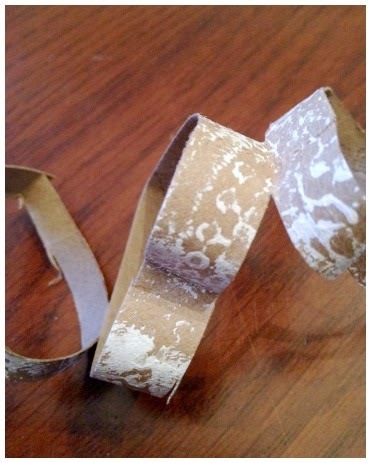 Carefully roll your tube over the paint saturated area on the lace scrap. 6. Pour paint in other colors over the rest of the lace. Spread it out with the foam brush. 7. Roll one tube at a time in each of the separate colors. 8. Make sure you roll only once, in one direction, pressing down quite firmly as you do so. I used both hands, not just one as it appears in the photos. 9. Let your little hands help you! They love this messy part. 10. The lace details will not transfer perfectly to the tubes, though if you had a straight piece of lace and not a curved one like mine it would be much easier to stamp the design more accurately. We did notice that the designs were much easier to see with the darker colors. Not sure why. Repeat these steps with all the colors you want on all the tubes. 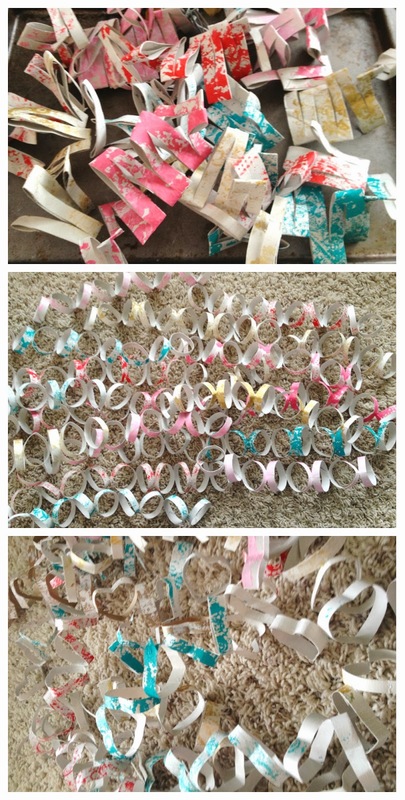 We did white, light pink, dark pink, red, turquoise, and gold. 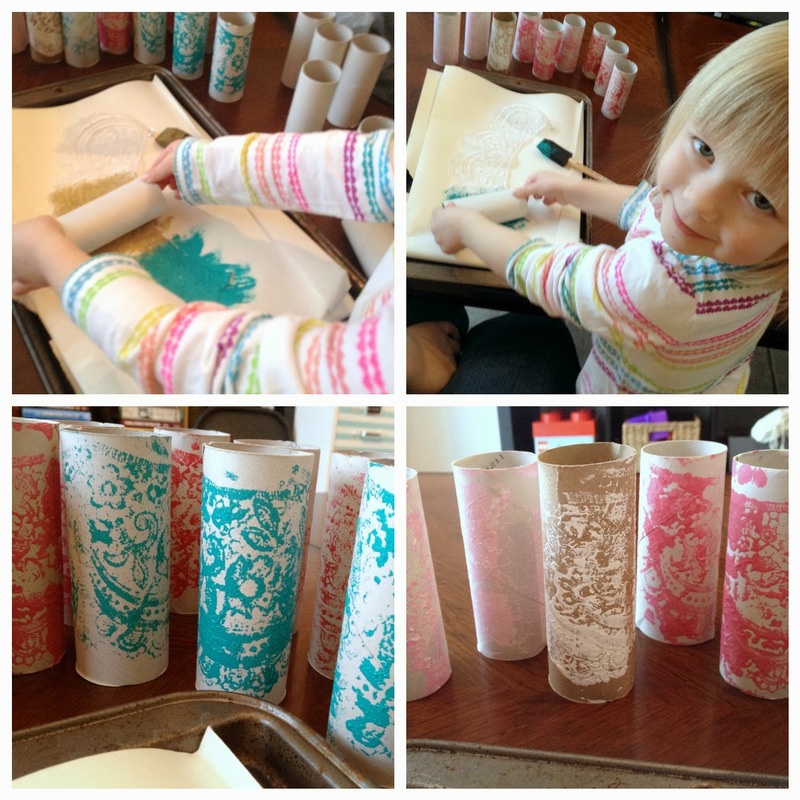 Be sure to let all the tubes dry completely before moving on. It should only take about 15 minutes. 12. starting at one edge and stopping about 1/2 an inch from the other edge. 13. Begin on one end of the tube and alternate which side you cut in from so the slits are not all on one side of the tube. 14. This will flatten the tube. So take the tube in your palm and squish it back into a circular shape again. 15. 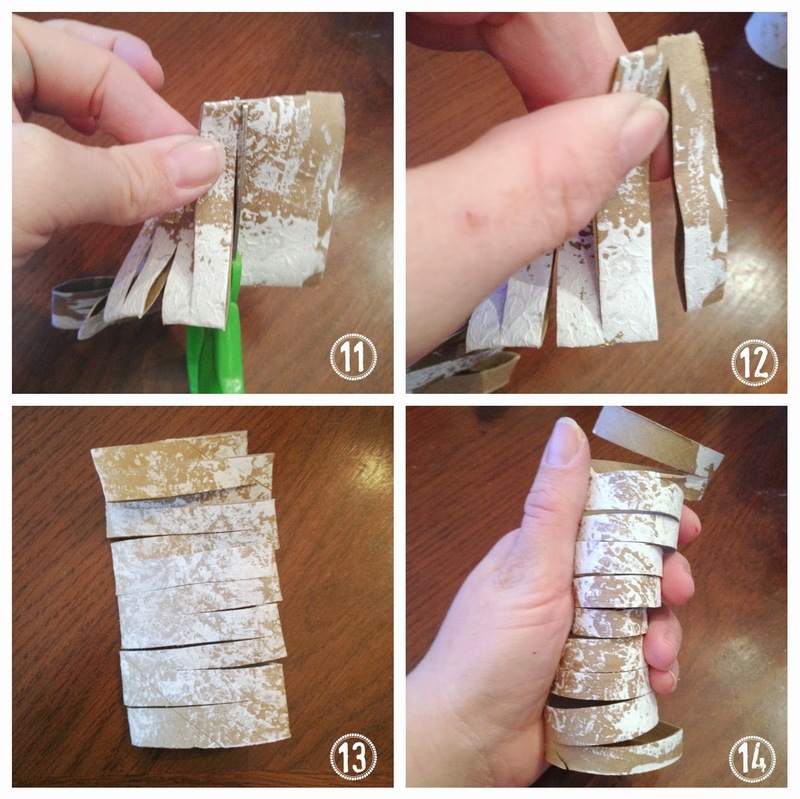 Gently pull on the ends of the tube to separate the slits and unfold them into circles. You will need to really bend the circles together where they are attached to get them to open up all the way. 16. Pinch the top, middle part of the circles together and down into the circle to make the top of the heart. 17. Pinch the bottom middle of the circles together and down to form the bottom of the heart. 18. Look! A chain of hearts! If you have a lot of tubes - and we did have quite a few - you'll likely want to do these past few steps conveyor belt style - first cut slits in all the tubes, then squish all the tubes back into circles, then open all the tubes into chains of circles, and pinch all the circles into hearts. Then all you have to do is use a hot glue gun to glue the chains of heart together end to end to make the chain as long as you want it. For some reason there's no photo of this step. This part is totally optional, but a cute way to finish it off. 19. 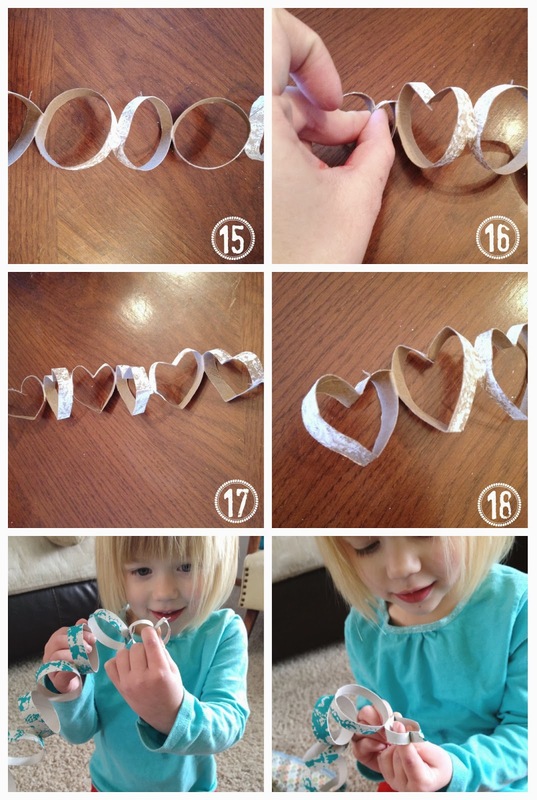 Use your scissors to make a slit in the outer side of the last heart. Stick a piece of ribbon through the slit. 20. Tie a knot in the end of the ribbon that's inside the heart. 21. Tie a bow in the end of the ribbon that's OUTSIDE the heart. 22. 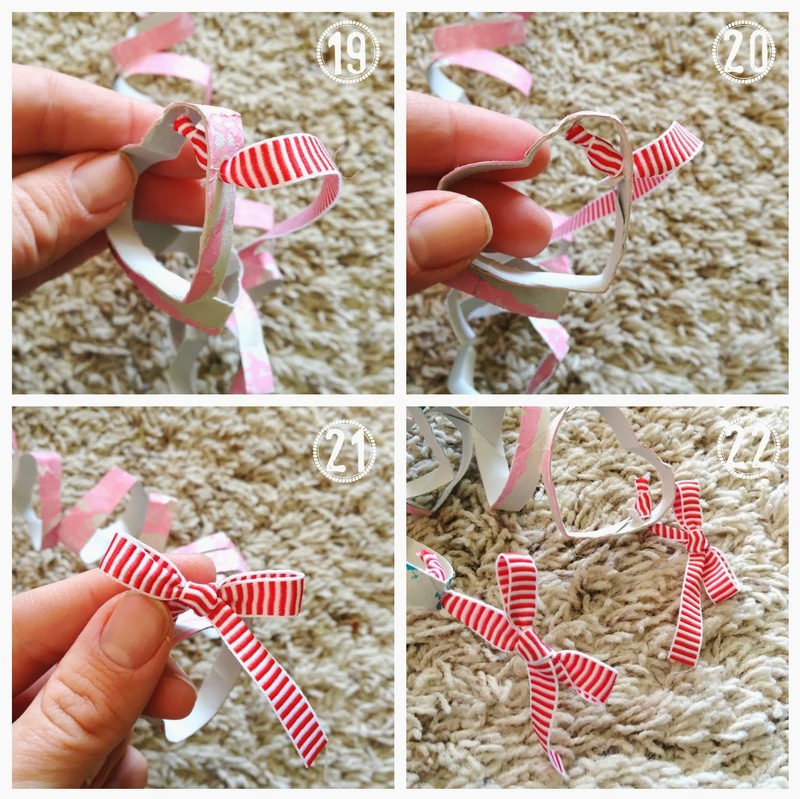 Do this with the heart on each end of the garland. You may wonder, as I did, why you would bother to stamp the tubes at all if you're just slicing them up. Below you can see that some of the details are still noticeable after cutting. Now, how noticeable the patterns are will depend on how much space you leave between slits - or how wide you make each heart. The wider you make them, the less hearts you will get out of each tube. I also discovered that the really wide ones didn't keep their pinched shape as well as the slightly smaller ones. I like the somewhat distressed look. And no, my "mantel" isn't done yet. Sheesh. 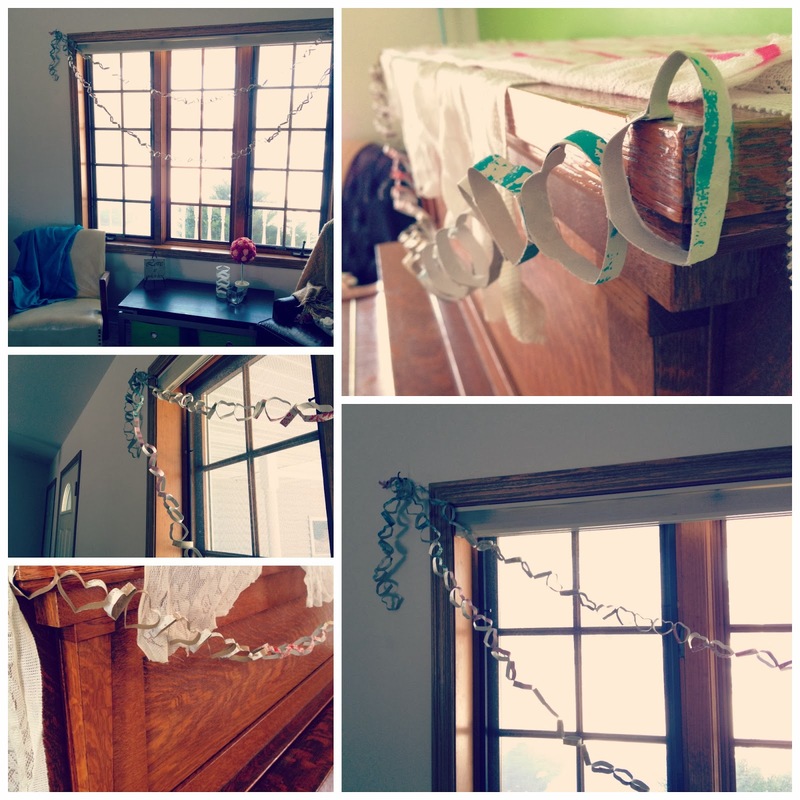 But at least I have a cute, upcycled, kid-friendly, Valentine appropriate garland to show off.